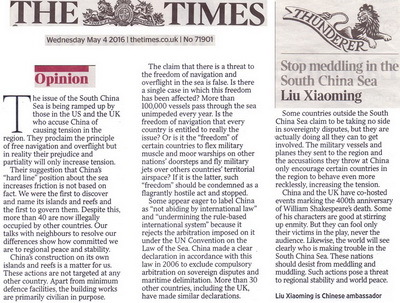 The Times Published A Signed Article by Ambassador Liu Xiaoming Entitled "Stop meddling in the South China Sea"
Their suggestion that China's "hard line" position about the sea increases friction is not based on fact. We were the first to discover and name its islands and reefs and the first to govern them. Despite this, more than 40 are now illegally occupied by other countries. Our talks with neighbours to resolve our differences shows how committed we are to regional peace and stability. China's construction on its own islands and reefs is a matter for us. These actions are not targeted at any other country. Apart from minimum defence facilities, the building works are primarily civilian in purpose. The claim that there is a threat to the freedom of navigation and overflight in the sea is false. Is there a single case in which this freedom has been affected? More than 100,000 vessels pass through the sea unimpeded every year. Is the freedom of navigation that every country is entitled to really the issue? Or is it the "freedom" of certain countries to flex military muscle and moor warships on other nations' doorsteps and fly military jets over others countries' territorial airspace? If it is the latter, such "freedom" should be condemned as a flagrantly hostile act and stopped. Some appear eager to label China as "not abiding by international law" and "undermining the rule-based international system" because it rejects the arbitration imposed on it under the UN Convention on the Law of the Sea. China made a clear declaration in accordance with this law in 2006 to exclude compulsory arbitration on sovereign disputes and maritime delimitation. More than 30 other countries, including the UK, have made similar declarations. China and the UK have co-hosted events marking the 400th anniversary of William Shakespeare's death. Some of his characters are good at stirring up enmity. But they can fool only their victims in the play, never the audience. Likewise, the world will see clearly who is making trouble in the South China Sea. These nations should desist from meddling and muddling. Such actions pose a threat to regional stability and world peace.